Buttons and Butterflies: How Long Did That Quilt Take You? Yesterday, a few of us in a small quilting group on Facebook were discussing how much time it takes to do a quilt. We sometimes get asked by people, and the glaring and resounding fact is that very few really know! So many of us quilt a little bit here and a little bit there, but no one seems to really know the exact amount. It reminded me that I used to log my time. It was only in the past two years that I haven't been as consistent. Which is funny, because I have completed equal to or more quilts in the past two years than the other 13 years of my quilting life! A good old fashioned spreadsheet. I print one off for each project. I write the "name" of the quilt on it and keep it with my project/design file folder. I have different headings: Consultation, Design, Material Shopping, Foundation/Paper design, Cutting, Piecing, Applique, Basting/Load LA machine, Quilting, Binding, Quilt Label, and Final Touches (snipping threads, washing quilt). I have Start and Stops at the top heading. The idea is that I enter the time I am starting and then the time I finished. If I am called away from the project, I just quickly write the actual time I stopped. I figure out calculations when I have completed them at the end. I tried to do this once on a computer without printing and it did not work at all. I found it tedious because I had to pull it up on my computer every time I wanted to work on something. Sometimes paper on pencil seem the more practical route. And for those who ask, what about emergencies? Do you actually take the time to write it down when you the boys need you? YES! Bleeding? Must be a copious amount. Broken bones coming out of the skin? No, suspected broken bones don't count. Dying? Like I need to call 911 ASAP. Not, I smashed my toe on the corner of the entertainment unit that I kicked in fury because I lost my NBA game on PlayStation. Otherwise? I will be writing my stop time down before I come to give some pats on the heads. 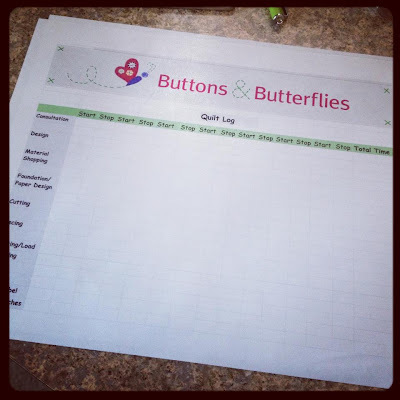 Reasons to keep a quilt log? I like to see what parts I spend the most time doing. I will be honest. I spend WAY too much time on design. It is definitely my weakness. It is handy to have if a customer wants a quilt I have already done. I know exactly how much time I need! I like to see where I can improve a skill. Am I making something too hard? Could I lessen the time spent on a certain step? Pricing, pricing, pricing. How do you know what a quilt is worth, if you don't know the hours that were spent on it? All of this leads to a related topic. Project plans and checklists. How do you handle that? Do you break down every quilt into steps for what you need to do? It feels empowering to check things off my list. I just saw this on a blog I follow, from Pixels to Patchwork. Isn't it the coolest thing? I just love how she has expected due dates and priorities. The organizing freak in me EATS that up! 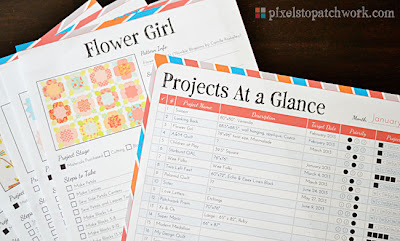 I also love how each project sheet showcases the design! I inquired and she said she is working on an editable Microsoft Work version. I told her it will go viral! I don't know if I can wait and might try to finagle a version for myself on the Mac. It certainly wouldn't be as fantastic as hers...I am no graphic artist!! This all brings me to a question for you. How do you organize a project? Do you keep track of them? Do you log in your minutes, hours, and days? What part of the project takes the longest for you? Or are you like some of my quilting friends that say "I'd rather not know"? And I love the box idea!!!! I've never kept track of how long it takes me.....but I love the idea....maybe something new to try this year! I'm with Sharon. I sew for fun, to relax, because I dislike tv! Being this organized would take the fun out of it. With that said back in 1993 I kept track of how many hours it took to make my sisters HS graduation quilt cuz I thought about making and selling quilts. It was over 200 hours! And at minimum wage($5 then) no one was going to buy a $1000 quilt. So I found it best not to know the hours and just enjoy the craft and the experience! This is such a good timely post Heidi, i've been wondering for a long time whether I could find an easy (i.e. maintainable) time-tracking system. People constantly ask how long it takes me and I never know. A lot of the shows we're entering now require a sale price on the art quilts too, and I never know what to put. Obviously, a lot goes into pricing quilts (in addition to time) but having an idea of the time would be a good start. Question though- How do you track time when you're working on two different projects at the same time? I'll often spend an afternoon going back and forth between a couple of projects, as one has paint drying I'll quilt a bit on something else and then go back. Do you have a way you address that? Shannon, I definitely don't base my quilt costs on time, because really? It isn't reasonable. I just helps guide my final decision. I am lucky and have a lot of counter space. I try to keep my pattern/design file in the bin of the fabric/blocks I am working on. That way it is there when I am working on them. The whole reason I sub-categorize with the headings are because some days I might be piecing. Stop. Then want to sit down and bind the other. So it seems to work for me when I am leaving the one to mark my time and when I am starting the other because it is all out. And for me, it isn't tedious. My schedule can be super tight, so I am very cognizant of the time. But I can see how it would not be enjoyable for others! I'm still working on my "first" quilt. It's a king-size with small nine-patches and a pieced children border. It's also something I've been hand-quilting over the last ten years or so (and I'm still not done). At one point, I calculated that I had put in over 1,000 hours on it and I'm still not finished. After that calculation, I don't want to calculate the time it takes me to work on something. It's too intimidating! But, I can get a baby quilt done in a weekend if I put my mind to it and just get it done, so it evens out. And, I don't sell quilts. So far, I've finished about two dozen since I started in 1998 (I only tie baby quilts and I only hand quilt big quilts, so the big quilts are time-consuming), and I've given them all away as gifts. If this was my business, though, I'd probably log time "lawyer-style" in 6-minute increments. I'm type A, so I must admit, this looks like fun to me! Unfortunately making a good hourly wage isn't overly "reasonable" when selling quilts (boo) but I am interested in seeing where I spend most of my time when making a quilt!